Heat oven to 350°F. Make and bake brownie mix as directed on box, using butter, eggs and any of the pan choices—except line pan with foil, then grease foil on bottom only for easier removal. Cool completely, about 1 hour. In medium bowl, stir filling ingredients until smooth. Spread mixture evenly over brownie base. In small microwavable bowl, microwave topping ingredients uncovered on High 30 to 60 seconds. Stir until smooth; cool 10 minutes. Spread over filling. Refrigerate about 30 minutes or until set. Store covered in refrigerator. 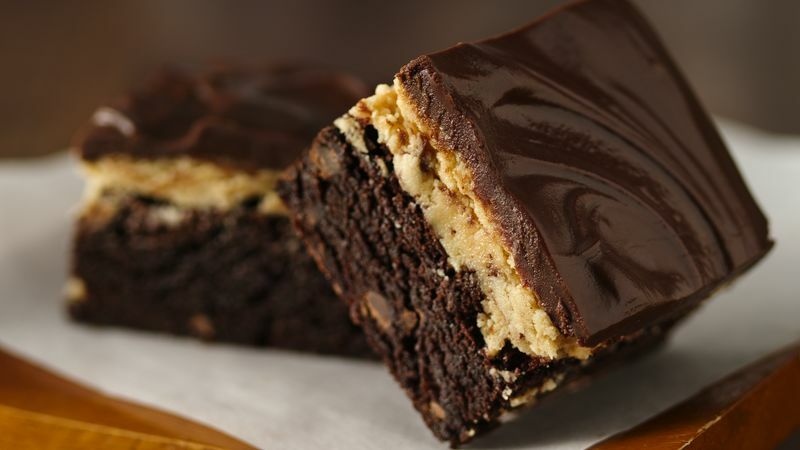 These brownies are ideal for a dessert buffet. Cut them into bite-size squares and arrange on a decorative platter for serving.